Haldex Concentric has developed a low-cost fuel pump and adaptor for Volvo Penta, allowing it to use a standard unit without changing the engine configuration. The new unit replaces a fuel and steering pump combination originally designed for 9 to 11 litre automotive engines but also used in gensets and marine applications where the steering pump was not required. The solution is a transmission module (or interface) between the engine and the fuel pump. 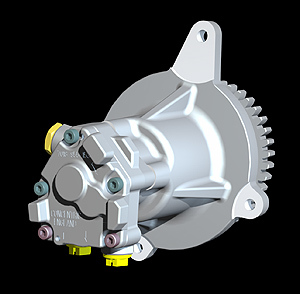 Since the interface unit functions as the drive alignment between the engine and fuel pump, both the interface housing and internal drive shaft have to be machined to micron tolerances. Haldex Concentric utilized its centres of excellence for fuel pumps in Birmingham, UK and for sealed assemblies in Pune, India to achieve the required combination of a high performance pump at a globally competitive price. The company invested in a new state of the art production line in India to machine and assemble the interface, which has ensured that cost targets were met whilst also ensuring high quality and accuracy. The completed aluminium components, including drive shaft and seal housings are then shipped to Birmingham, where they are assembled into to the UK-produced pump and gear to compete the module ready for supply into Volvo plants in France and Sweden. To ensure a zero defect manufacturing process within the UK, Haldex Concentric has invested in an advanced, fully automated test and assembly system designed to achieve a 'no faults forward' solution. The system checks components entering and exiting a process and, where a concern is detected, automatically picks up the components concerned and segregates them from the normal process. This relieves the unload operator of a responsibility and ensures that components in the unload station have passed all necessary quality criteria prior to packing. The new pump module developed by Haldex Concentric has enabled Volvo to replace a partially inactive system without the necessity to make any engine modifications. Since the design is backwards compatible, it will also benefit end-users should a replacement be required for older power steering and fuel pump modules. Haldex Concentric is part of the Hydraulics Division of Haldex AB. The unit is a major supplier to the world's truck, agricultural and construction equipment industries, with manufacturing facilities in Germany, Sweden, the USA, China and India as well as at the divisional headquarters in Birmingham, UK. In addition to oil, fuel and water pumps for diesel engines, Haldex Concentric manufactures the Alfdex air/oil separator, Varivent EGR accelerator, integrated front cover assemblies and lubrication pumps for transmissions and reciprocating compressors.